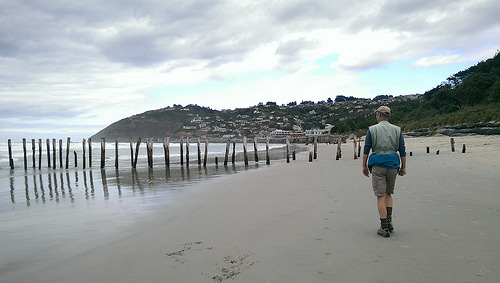 Despite Dunedin’s harsh winters, it has some of the best beaches and coastal scenery in New Zealand. 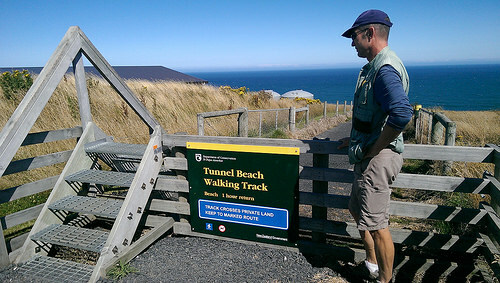 Today, we’re exploring the Dunedin Tunnel Beach walking track. How grateful we are that the southerly we had yesterday, has finally gone. This was our morning stroll along the beautiful misty St Clair Beach. Even on misty days, this beach has wild beauty about it. There are always plenty of locals out enjoying this famous landmark. Michael checked out the salt water pools for his morning swim. Travellers should keep this in mind. It’s a good facility and it has a cafe attached. If you look hard, you can see it right at the end here. 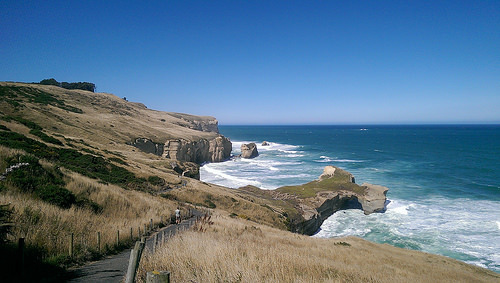 There are few places in New Zealand that have both beautiful beaches and a dramatic cliff coastline. Dunedin does! 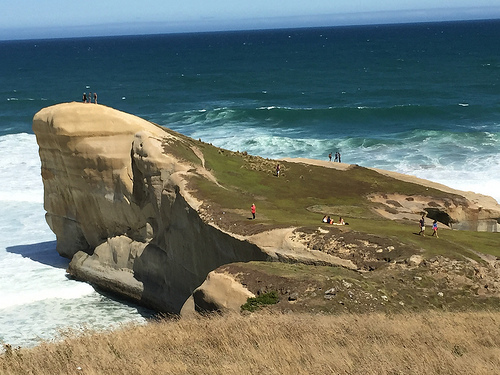 The Dunedin Tunnel Beach walking track is accessed from St Clair and has the most fantastic sculptured limestone cliffs. If you want to do this walk, put your sturdiest walking shoes on. Make sure that they have a good tread because this is so essential on the Dunedin Tunnel Beach walking track. The track is wide but rather steep so its fair to say, a good level of fitness is required. Today I saw saw a woman struggling back with her baby in a pushchair! During peak season, there are many visitors here. The views along the track are mesmerizing and at first, you won’t notice that the track is getting steeper. I quickly fell behind and Michael became a tiny figure in the distance. Its worth making it down to that wonderful piece of rock jutting out in the far distance. The views will most certainly overload your senses. Now here’s a word of caution – there is no barrier fence here – be very careful when getting your loved ones to step back for a photo. 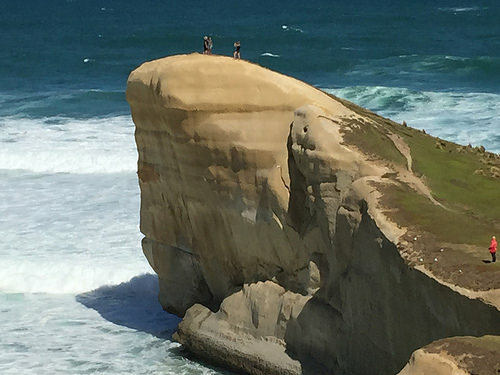 For the time-strapped traveller, the Dunedin Tunnel Beach walking track is perfect. 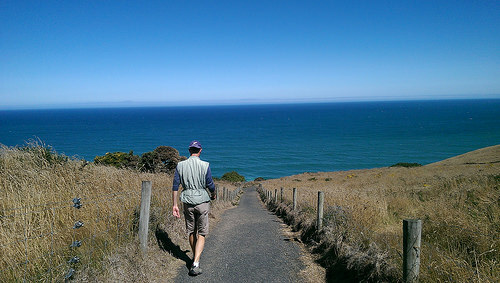 Its an hour-long walk with beautiful views – plus its great for your fitness. 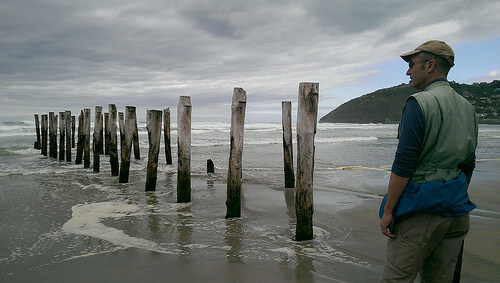 But being here, reinforces the fact that Dunedin is not just a city of many charms. The surrounds are a such a drawcard for nature lovers and hikers. Friends of ours just moved back to Dunedin so gives us a great excuse to visit. Always charmed by the beauty of Dunedin sitting in the harbor and surrounded by the sea but Tunnel beach I am yet to visit – now definitely on my to do list after seeing these photos – wow, what an awesome and diverse country we live in. No wonder our visitors love it so much. I think since being on our travels Jan, it’s the diversity that we’re really loving. The beauty down here is wilder and majestic. It’s also inspirational meeting visitors on the tours we do who are just enthralled.